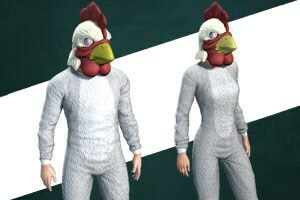 Scare the cluck out your enemies with this Chicken Mask and Animal Suit. Let the ladies know where you're at with ease by using the yellow colored "Chick Magnet" character title unlock. Did we mention this pack includes a onesie? You can be styling and comfortable at the same time. Onesie for the win! Get yours this Easter!